So who’s looking to finish up one more project before the year is out? For me, I’m hoping to work on Jalie’s (free) pattern, Yoko today. I have the pattern printed, the fabric selected (a thin little hacci sweater knit that I picked up a few months ago from Girl Charlee), and the will to create! Of course that all has to be squeezed in between cleaning the storage room (we have accumulated 11 years worth of items in there) and a trip to finally cut Easton’s hair – so here’s crossing your fingers that this gets done before midnight! What’s on your list today? This entry was posted in Uncategorized on December 31, 2018 by stacy. These color block hot pads would make the perfect hostess gift for New Years – just stuff them with fun kitchen goodies! Too bad that my hand sewing skills aren’t up to par because these embroidered photo ornaments would have been a cute addition to the tree. There are always so many trims that I love, I have a hard time deciding what to use. Now I don’t have to, because this ribbon flap shoulder bag can show them all off! Have leftover trims that aren’t big enough for another project? Turn them into a pencil case. This woven basket is a great way to get yourself organized for the new year. While you’re visiting the site, be sure to enter to win one of 5 LED sewing machine light kits! This portable first aid kit is perfect for stashing in the car and toting in a purse. This one looks a tad smaller, but has a cute red cross patchwork on the front. Ironing board looking a little rough? Make a new cover. Then use your leftover scraps to make this easy ironing board organizer. I’m a sucker for a cute weekender bag. This one definitely makes me want to sew one. I’ve never seen a wet bag for the kitchen before, but it doesn’t seem like a bad idea especially when you’re doing lots of holiday cooking and baking. This entry was posted in Uncategorized on December 27, 2018 by stacy. If you check your local newsstand, chances are you may catch a glimpse of my beret project inside the latest issue of Creative Machine Embroidery magazine! 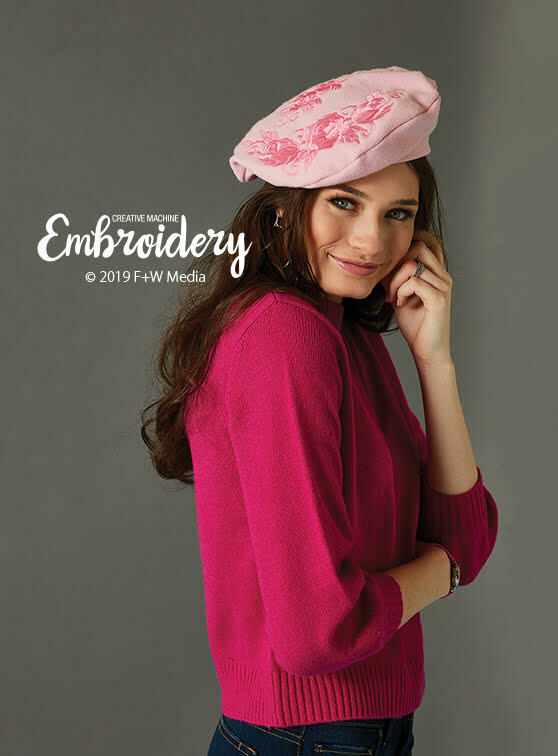 Inside the January\February 2019 issue is how to create this fun accessory by adding tonal embroidery on of the hat – it’s perfect for wearing on a romantic evening out. This entry was posted in Uncategorized on December 21, 2018 by stacy. Jalie has a new pattern out…. and it’s FREE. Grab your YOKO square roll-neck top and have a new sweater before the end of the day! This little mini scissor case is perfect for stashing necessities and makes a great gift for other sewists! Add a bit of bling to your holiday wardrobe by making yourself a custom fit, sequin skirt. This scarf looks extra warm and cozy, but the big pompoms make it fun to wear. Look extra glamorous by making this turban style headband in velvet. Add a bit of handmade to your tree with these fabric star ornaments. Traveling for the holidays? This kid’s size travel pillow is easy to carry and super soft to snuggle with. Win a Sweet Caroline fabric bundle. I love how this Rocky Mountain Satchel “crushes” when carried so it has a fun, casual feel for a bigger bag. I’ve been seeing lots of photos of these stacked tabletop tree decorations online lately, but no links to an actual tutorial…. until now. Learn how to make your own, too! Looking for a great last minute gift? This cool clutch is adorable! Don’t forget your pup this holiday – this Kimono Dog Harness is the perfect present for your pooch. Have a cat instead? Stitch them up this awesome cat bed. This entry was posted in Uncategorized on December 20, 2018 by stacy. I was wrong. I was not done giving handmade gifts this season. However this time instead of making clothes, I made bags! (And then I thought I took a picture of them, couldn’t find the photo, and now they’re wrapped – so you’ll have to use your imagination on this one!). I opted to make 2 messenger bags for my brother and sister in law – both messengers. Mostly because I love the style, but also because I think they will too. For her version, I used Betz White’s Midtown: with faux leather accents and strap and Amy Butler material for the body. For his I used the Ravenwood pattern in a solid canvas for the body. I’m disappointed I didn’t get a photo, but I’m happy to say that I’m done sewing gifts. I’m contemplating sewing up something to wear for church this year… I have a printed velvet that I picked up last year that’s been screaming to be made into something for the holidays! This entry was posted in Uncategorized on December 18, 2018 by stacy. Is it wrong that I sort of want to keep this Astoria for myself? I’m guessing since it’s a Christmas gift, I’ll have to give this one up, but I will say that I love this tunic so much more than what I thought I would! This time around I opted for “View B” (you can see my previous version here) – a non-ruched front with a cowl neckline. I used the remnants from the Christmas Leggings to create this version and was happy that I had just enough material to make this work. The only modification I had to make was cutting one section of the cowl into two pieces which is hidden on the underside of the full section. 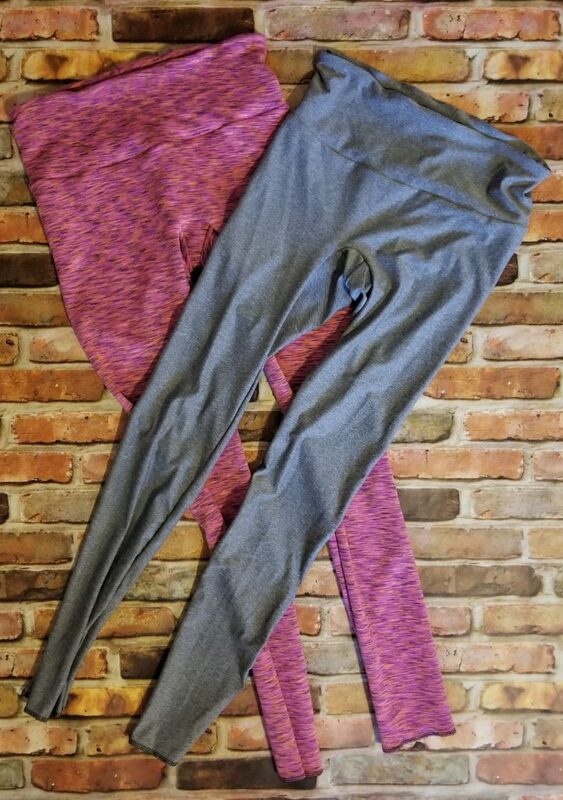 My other concern about this project was the weight difference between the two fabrics – the pink is very thick and heavy while the gray has a lot of drape and is very lightweight. Surprisingly, it worked out. I only used the pink as the accent pieces so it really doesn’t effect the drape of the top. Using the pink also seems to help the cowl keep it’s shape (and should be very warm, too). Now that this top is done, I’m thinking that I need raid my stash and make something similar for myself. As much as I love using wild prints, I really like how more solid materials worked so well together. This entry was posted in Uncategorized on December 14, 2018 by stacy. If you’re still needing the perfect party dress, look no further than the Patsy. My favorite part about cold weather is all the layering possibilities. This circle vest is easy to wear and easier to sew. Looking for a festive table decoration that shows off your favorite holiday fabrics? This little tree is perfect! Want something similar that comes with a template (instead of drafting your own)? Try this version instead. Like it or not, fanny packs are making a comeback. Here’s another version to give a try (you’ll need the code found in the Winter Wear Facebook group to get this one for free). Make a perfectly fitting skirt based on your measurements just by using this tutorial. This Uvita Top makes a great wardrobe staple. A lot of pouches have you sewing it up in the way that the top edges are “dented”. This tutorial teaches you how to make one with perfectly crisp corners. Hosting a Christmas party and need an apron that makes a statement? This one lights up! This simple shirt might be too cool to wear now, but it sure will look adorable in the spring (website will probably need to be translated). This Danish Star ornament is a great way to use of fabric scraps and looks fun to make too! This laminated toiletries bag is different than most as it has a wrap around zipper. It would make a great holiday gift, too! Remember those cute Christmas gnomes I shared a few weeks ago? Well now you can make a coordinating quilt block too. Visiting family over the holidays? This weekender bag is an adorable way to pack your clothes. This entry was posted in Uncategorized on December 13, 2018 by stacy. So I may have figured out how to post photos… again. So as a follow up to yesterday’s post, here’s the accompanying picture. Both Clara leggings are currently un-hemmed until I’m ready to put the hems onto the coordinating Astoria as well. This entry was posted in Uncategorized on December 11, 2018 by stacy. Early on I had mentioned that I wasn’t sewing for Christmas…. then changed my mind, bought fabric, and set to work on several pairs of leggings for my mom. Over the weekend, I finished them up… only to discover my blog writing format changed and now I can’t figure out how to post photos. So…. I’ll have to leave you hanging on how they look until I figure that out later on today. In the mean time, one gift down, one to go! This entry was posted in Uncategorized on December 10, 2018 by stacy. Patterns for Pirates has cut files perfect for pajamas, an infinity scarf with a hidden pocket, and a fun, holiday stocking hat. 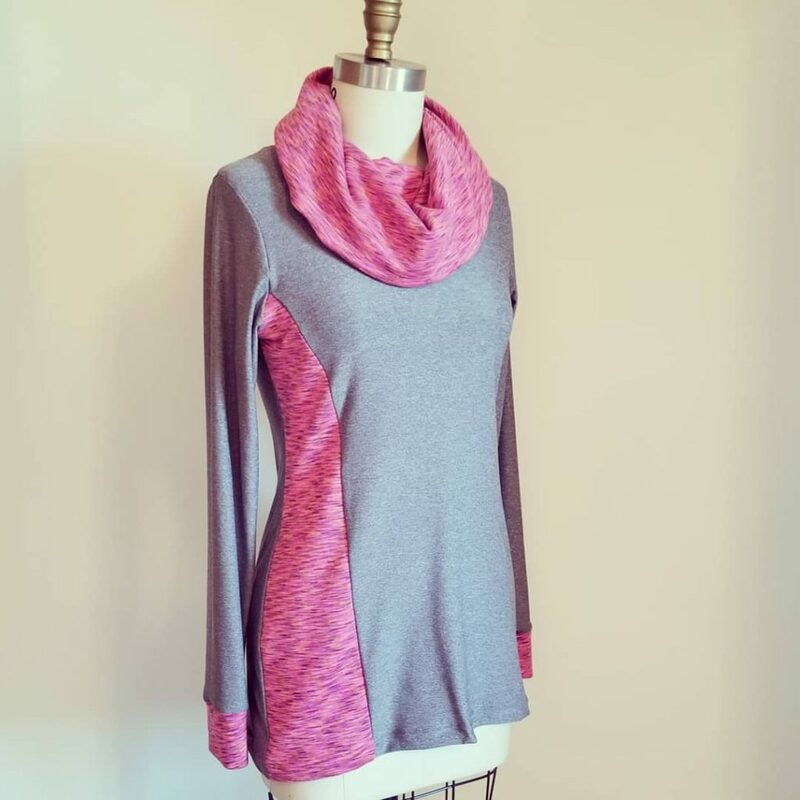 Winter Wear Designs has their own cut files as well as a freebie legging pattern (with several design options) and sleeve pack that fits her patterns (there are free shirt patterns available too). Along with sales, Peek-a-Boo pattern shop has a quilted potholder tutorial up on their blog. George & Ginger is doing some giveaways on their Facebook Page including a Singer Heavy Duty machine (ends today) and a copy of three new patterns that will be released soon. Learning how to make a fabulous hoodie. Sewing up a bum bag\fanny pack. Enter to win a 5 pattern bundle from DIY Fluffies. This holly leaf bow tie is the perfect way to look festive at his next holiday party. Stitch up a fur & fleece infinity scarf (and grab a hot cocoa recipe card too). These faux fur pompom keychains would make great stocking stuffers. Don’t want a key chain? Make earrings instead. This entry was posted in Uncategorized on December 6, 2018 by stacy.